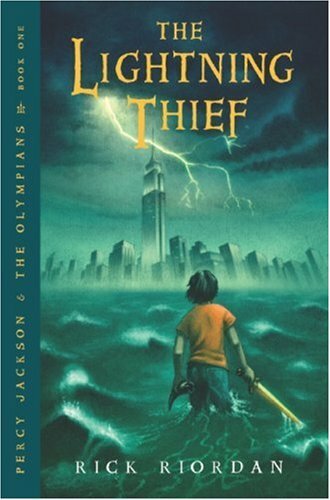 I was hesitant to read THE LIGHTNING THIEF; in my mind I had lumped it with other recent, wildly popular, boy-appeal, urban fantasy series which were, frankly, underwhelming. But I was pleasantly surprised by this fun, well-written story. Percy Jackson is a likable hero. He has dyslexia and ADHD, but doesn’t use the diagnoses as excuses. He’s twelve years old and is about to be kicked out of the sixth school in as many years. The only people at school who like him are Mr. Brunner, the Latin and Greek teacher, and his best friend, Grover, a scrawny kid with a muscle disorder. Percy loves his mom, and believes her story that his father was lost at sea. We later learn that Percy’s father wasn’t so much lost at sea but returned to the sea. Strange things start happening to Percy, beginning with his pre-algebra teacher’s scary transformation into a vicious Fury from Greek mythology. Other supposedly mythical monsters and heroes crop up, and Percy soon finds himself at a summer camp for demigods (the offspring of gods and mortals). Ares’s kids are big and ugly and warlike; Athena’s kids are grey-eyed and wise. The camp is run by Dionysus, who is perpetually grumpy because he’s been ordered by Zeus to abstain from wine and must settle for Diet Coke. Percy learns that he is the prime suspect in the theft of Zeus’s master lightning bolt (“a two-foot-long cylinder of high-grade celestial bronze, capped on both ends with god-level explosives”) and sets off on a quest to retrieve it, accompanied by Grover (who turns out not to be a kid with a muscle disorder) and Annabeth, daughter of Athena. “Eeew!” said one of the girls behind me. The characters are interesting, and there are bits of humor interspersed (the Naiads enjoy underwater basketweaving, and the Minotaur wears nothing but bright white Fruit of the Loom underpants). Overall, a very entertaining read, and may have a side-effect of encouraging kids to learn about Greek mythology. I love this series, and it just gets better and better as it goes along! I love these books! In addition to being vivid, exciting and overall fun, they're a great way to cement Greek Mythology in your memory. Ah, I love this series! Such fun! Great review, Laura! My son likes these books. Guess I need to read them too. Looooooooove this series!! :) I love all of these books, and the other 2 series! And he is a wonderful speaker- I have gone to his book signing before and I love watching his interaction with the kids. They love him and I know that he loves them to, and you tell by the quality of his books. Thanks for the great review!